What color Zephyr did you use on the second design Melanie? It photographed lovely. Ahhh...the pink blob... it is siply beautiful. Your patterns are so lushious. Start planning a book Melanie - your subjects are waiting! It's incredibly fabulous, Melanie. Thank you for such a fun MS3 and these beautiful, creative, original designs. You've outdone yourself with all the options. And I don't think you are charging enough! OMG, the pink one is gawjus. I participated in MS3, and I'm going to by the double winged version as well! Melanie, absolutely GREAT work! I can't believe I'm considering knitting another one so soon, and my 1st one isn't even blocked! Thank you for this pattern. I was watching knitters make it on different blogs and I was hoping to find the pattern. I ordered it right away. Awsome. Gorgeous, Melanie! Thanks for a wonderful MS3 - what an enjoyable summer of knitting you created for us! Melanie, Thank you for a lovely garment I will truly enjoy wearing. Your pattern is outstanding, your charting and directions a pleasure to follow, your "mystery theme" lots of fun. I joined fully expecting to set it aside for a future time, but was caught up the fun with everyone else and finished it in time to wear to a wedding two weeks ago. I've ordered right away! Thank you so much, Melanie, for so much fun knitting the MS3 during this summer. It was really fun and the stole is so beautiful! I've regretted not joining MS3 all summer, and have been desperately waiting for the pattern! I love it :) Thank you for getting it out so speedily, and I can't wait to start! Melanie, thanks for your generosity. I did finish my winged shawl - and guessed the theme! It will be a Christmas gift for my best friend. If you're eve in the Charlottesville area, give me a holler and maybe we can meet. I'm in Afton. I, too, watched all summer as MS3s were progressing and regretted not getting signed up! Thank you for the gorgeous, gorgeous pattern. All of your designs are incredible! I hope to finish Schereazade this weekends and Swan Lake within the next couple of weeks. I so much appreciate the Mystery Stole experience and your incredible generousity. The double wing stole is beyond words! I can't wait to begin! 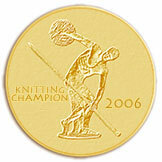 Would that I could knit fine yarns on tiny needles ... both are breathtaking! The pictures Joy has of her shawl are fantastic. Would that I was slim enough and beautiful enough to WEAR one!! Oh wow, that is gorgeous. All of the versions! So beautiful. Thank you so much for all the hard work you put into this! It was really a blast to knit the MS3 along with so many others. I bought Swan Lake here even though I'm an MS3er. I felt that you put so much energy and effort into this that it was well worth the 6 bucks and more. I am going to knit the double winged version next. I knit the MS3 as a symmetrical grafted version and it won 2nd place at our LYS contest! I was thrilled! Thanks for all the fun. Thank you so much, Melanie, for this via MS3. I can't wait to finish up! 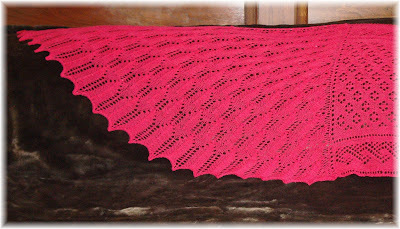 Melanie, this MS3 knit up into an absolutely gorgeous shawl and I love mine. Would it be possible for you to find a model for your double winged beauty so that we could see what it looks like being worn? The idea of it makes me want to knit it, but I have to admit, I couldn't finish the winged version of MS3 until I saw pictures of it on a model. I do not regret it though! I really enjoy seeing your designs and would like to make one of them. Which do you recommend for a beginning knitter who has never done lace before? The wing design is really beautiful. I'm so impressed. I've knit the one-winged version and love it!! Thanks so much for a wonderful pattern. I love the pink one too. Melanie - just beautiful and I love the symmetrical wing option. I may have to see if I can do this one! Melanie, I've just finished knitting the Ms3, and I wanted to thank you for sharing this gorgeous pattern with us this summer. 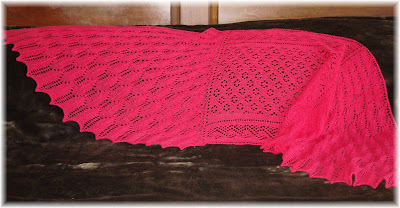 It's one of the most beautiful shawls I've ever seen, and I look forward to knitting again with your next summer! Hi Melanie, Can I pay by check for the pattem of 'Swan Lake', what address should I send to? my email address is jenny_zhaochin@yahoo.com. I would like to purchase the Swan Lake pattern with either a money order or use my debit card. Your work is so beautiful. This stole is gorgeous! Is the pattern available in german? Greetings from snowwhite Germany. Marvellous designs, Melanie! I'm sooooooooo impressed! And not only me... 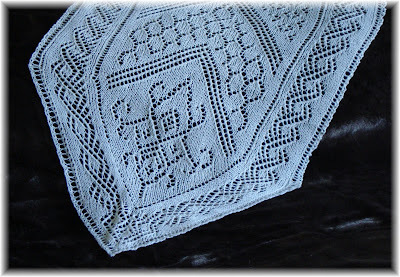 Many participants of the Russian knitting web-site are constantly looking for new patterns, trying to ceate their own ones and sure need a piece of advice now and then. 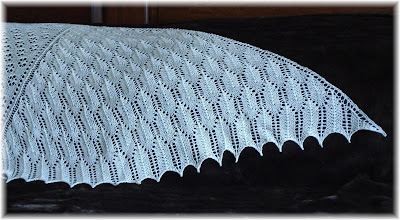 We do have a section dedicated to stoles here: http://forum.knitting-info.ru/index.php?showforum=1477 . But communication with the Author is quite different and much more fun. I suggest that you join our community, and not only for communication. You could also sell your patterns here. Our people are not used to sending money abroad, but if you sell through our site knitting-info.ru, this could be sorted out: Russian users will be able to pay Russian roubles, and you will be getting US$ via PayPal. What do you say to this? Hello! I love this pattern and began making it for a friend a couple years ago, but it ended up hibernating for a while and now I can't seem to find my printed copy of the pattern. I went to download it again from my Ravelry library, but it's not showing up in my purchases for some reason. I know I owned it, because I'm about 1/2 way done with it, but I can't access it there and was wondering if it's possible to get it from you without buying it again. oh, and my email (for the above question) is wintermoon3 at gmail dot com.